I've been a fan of Once Upon a Time since about episode four of season one. I love all the little nods to Disney movies and I think they've done a clever job of telling these fairytales in a fresh way. That being said, I will be the first to admit that the writers often bite off more than they can chew and end up with some loose ends. So today I'm going to address ten loose ends that I'd like resolved (my list goes longer than ten, but we'll start here). 1. Maleficent and Briar Rose: Season 4B resurrected Maleficent and we got to see her reunite with her long lost daughter and we got to see in flashback how she and Regina became friends. However, I'm still questioning why she cursed Briar Rose (Aurora's mother) in the first place. Is it because she wasn't invited to a party? Or is there some deeper reason? I'd like to know why and with Maleficent still in Storybrooke, I'm hoping that we'll find out at some point. 2. 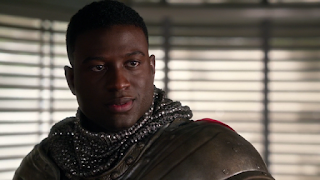 Will Scarlet in Storybrooke: Season 4 made Will Scarlet (aka the Knave of Hearts) from the Wonderland spin-off a main character. They promised to explain why he was there after his happy ending with Anastasia in the finale of the spin-off and yet all I got from him being in Storybrooke was him being a petty thief, a drunk, a replace to for Little John, and a rebound boyfriend for Belle. I was sorely disappointed with his use (or lack thereof) since I loved his character in Wonderland. He's so clever and witty and they missed out on properly using him. What happened to Anastasia? How did Will get back to Storybrooke? I'd like to know. 3. Tinkerbell in Neverland: In Season 3A we saw Tinkerbell helping Regina in the Enchanted Forest and then we have a gap in her timeline until she encounters Hook in Neverland in the mid-season finale flashback. How did she get to Neverland? What did she do for Pan? We didn't really get much there other than a bunch of vague implications. Unfortunately, the actress who plays Tink is busy, so we won't likely get to that one any time soon. 4. Ursula, sea witch or teen drama queen: Season 4B gave us Ursula the Sea Witch, who was apparently evil enough to match wits with Maleficent and Cruella. However, all we really saw of her past as a villain before becoming one of the Queens of Darkness was being rebellious and running away from home. Does turning herself into a squid and running away from her helicopter parent of a father really qualify her to be considered "evil"? I'm sure there's more to it, but I'd like to see why exactly we were supposed to fear her. 5. The Red King forgotten: So it's from the spin-off, but I'd like to see what happened to the Red King. Last we saw of him, he was marrying Anastasia (who had just agreed to learn magic from Cora, the Queen of Hearts). 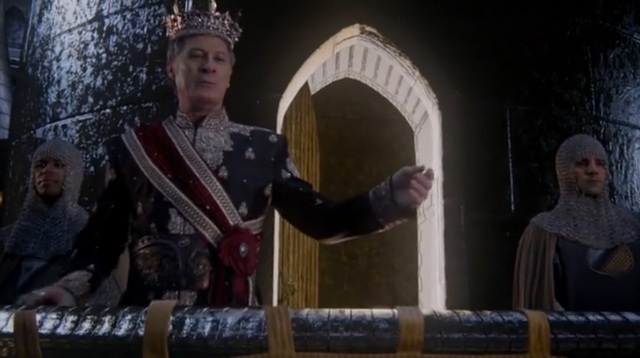 There were implications that something would happen to him, but the next thing to happen with Anastasia chronologically was that she was working with Jafar to capture Cyrus. Did Anastasia do him in? Did Cora crush his heart? 6. Cruella DeVil in the Enchanted Forest: I have several questions about Cruella. First off, how did she get to the Enchanted Forest? Somehow between killing her mother (and her dogs) and forming the Queens of Darkness, she got from 1920s England to the Enchanted Forest. My best guess is that Rumplestiltskin sent Jefferson to retrieve her shortly before the flashbacks in the Season 4B mid-season premiere. 7. Cruella the Grieved Villain: In the Season 4A mid-season finale, we see that the Queens of Darkness are sick of losing. I've already addressed that we know next to nothing about Ursula's past, but what about Cruella? Last we saw of her before meeting her new girlfriends, she was pretty victorious, having manipulated Isaac into giving her magic and subsequently killing her mother. Was losing her ability to kill really that big of a deal to her that she'd consider herself among the villains who were sick of losing to heroes? I get that she's crazy, but she's clever enough to manipulate people into doing the killing for her. Was that really not satisfying enough for her or did something else happen to get her to that place? 8. Queen of Hearts and her Ex: At some point before Regina manipulated Jefferson into taking her to Wonderland to rescue her father, Cora captured Henry and held him hostage. We know she wasn't in love with him, so the purpose of that capture is kind of ambiguous (Regina claimed the Queen of Hearts saw her as a threat, but Regina was a compulsive liar, so I'll take that with a grain of salt). Why did Cora kidnap Henry? Under what circumstances? Was she trying to keep him hostage in order to use him as leverage to get back to the Enchanted Forest? 9. The Lady of the Lake: Towards the end of Season 5A, we saw Lancelot leave Camelot to seek help from his mother, the Lady of the Lake. Presumably this meant he, like the people of DunBroch, were not caught up in the curse. That being said, I'd be really disappointed if it was simply a throwaway line to get Lancelot away from the curse. It just seems like it'd be a waste. 10. King Arthur of Camelot: In Season 5A we saw Arthur and his kingdom of Camelot brought to Storybrooke by Hook's curse. Arthur gave our heroes some trouble, but last we saw of him, he was locked up in jail. The writers have said (if I remember correctly) that we'll see more of them and that we'll get Camelot resolved more later. However, they also promised that with Will Scarlet, so we'll see. Just seems like a waste in a way to have brought them to Storybrooke. That being said, that's kind of how I feel about Season 5A in general. We seem to be right back where we started before Emma became the Dark One. But that's a rant for another time. Like I said, I'm sure there are more loose ends that I could come up with, but those are the first ten that come to mind. I'm probably awfully pessimistic in that I don't expect them to tie these all up. However, they'd all require the right opportunity and the right circumstances to resolve and based on what these writers did with Lost, it's not likely they'll tie everything up (and I was actually fine with how Lost ended). Still, I can hope that they'll address some of these at least. I think the writers think they can do more than they can (like biting off more than they could chew with the Queens of Darkness), but hopefully they can keep the show alive long enough to give us a good conclusion to the story. 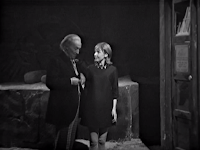 find "The Keys of Marinus"
By the time I got “The Keys of Marinus” from Netflix DVD, I was into the Second or Third Doctor on Hulu and I was getting a little drained of six-episode stories, so this story was refreshing. Even though it was six episodes long, each episode was a different setting, different subplot, making it more interesting and faster moving. Overall, this is one Classic Doctor Who story that would be easy to watch over multiple sittings, whereas many Classic Doctor Who would work better in one sitting. It’s one of the first stories of the series and from my understanding it was made out of necessity. While this story did begin to bond the Doctor, Susan, Ian, and Barbara as friends instead of allies of necessity, it was kind of boring. If I understood correctly, the “villain” of the story was more cabin fever and the TARDIS’s protective mechanisms more than anything. This story also really didn’t help my dislike of Susan. She was completely crazy in this story for seemingly no reason. It just seemed like everyone on the TARDIS was completely irrational in this one. 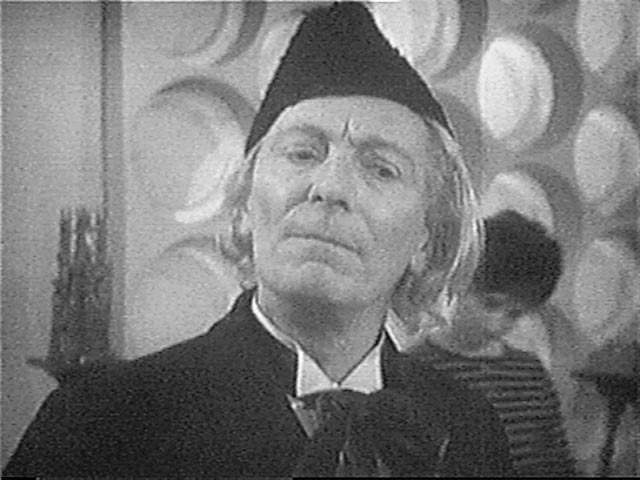 Doctor in "An Unearthly Child"
The second, third, and fourth parts of this story aren’t the greatest, but I had to mention “An Unearthly Child” since this is where it all began. At the very least, I recommend watching the first episode so that you get a taste of where the Doctor began (he wasn’t always so adventurous and fun-loving) and how he actually kidnapped two of his first companions! Another one that needed mention was the introduction of the Daleks, one of the most popular Doctor Who aliens. While a bunch of the elements of this story have since been abandoned in the Daleks’ design, the overall Dalek creatures haven’t changed much in 50 years. 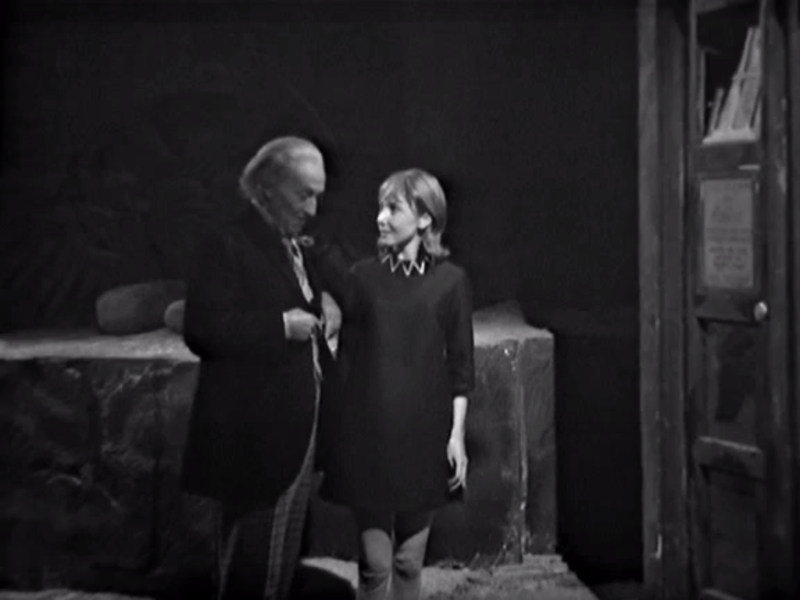 in the TARDIS in "The Rescue"
Just on the heels of leaving Susan in the 22nd Century, the Doctor, Ian, and Barbara meet Vicki. In contrast to Susan, she was competent, clever, and brave. In this episode, she is being tricked into staying on her crashed spaceship by the only other remaining survivor, Bennett, who turns out to be a homicidal maniac who had killed her parents and the people of that world. 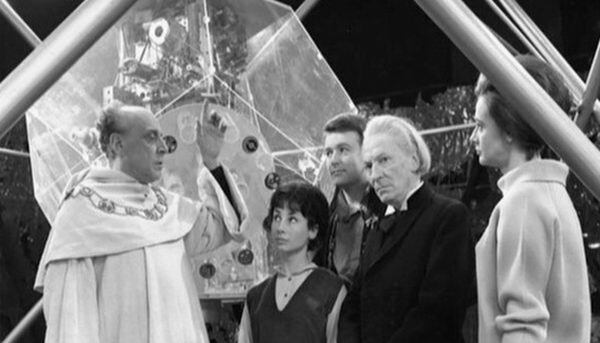 By the end, the Doctor and his friends invite the orphan to join them in their travels. It’s only two episodes, so it’s a nice easy watch, which I liked. 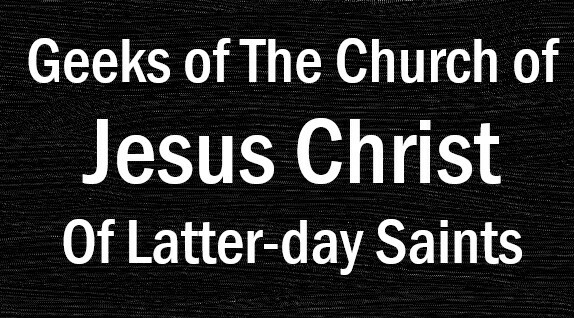 I’m not sure what it was about this story, but I had a hard time getting into it. 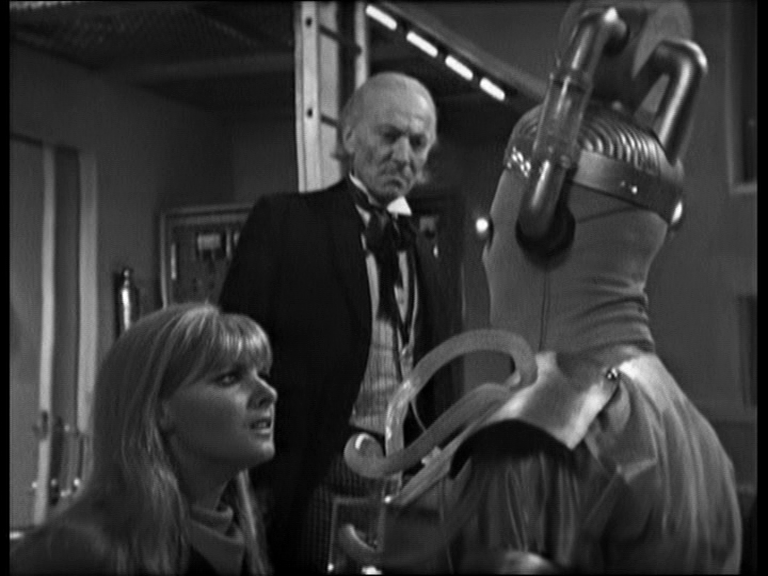 The Doctor, Ian, Barbara, and Vicki get attacked by the Zarbi on Vortis. Whatever the reason, whether it was the costumes, the story, the giant bugs, or whatever, I was not particularly a fan of this one. 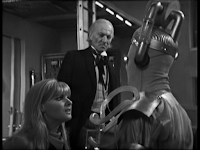 However, it is worth noting that the Zarbi later returned in the 50th Anniversary Comic “Prisoners of Time” again encountering the First Doctor and his companions. in "The Dalek Invasion of Earth"
It wasn’t on Hulu or Netflix DVDs, so I ended up buying it on iTunes. I figured it was worth it since this was the first time we said goodbye to a companion. 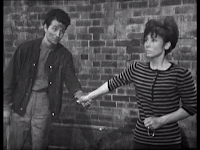 After defeating the Daleks after their invasion of Earth in the 22nd Century, the Doctor learns that his granddaughter has fallen in love with a human she met, so he leaves her behind to live her life with him. Even though I wasn’t a huge fan of Susan, it was sad to see the Doctor say goodbye to his granddaughter. I would definitely be up for seeing her again in the modern series. I think she’d go really well with Peter Capaldi. In the distant future, with the impending destruction of Earth (maybe the same event we saw in “The End of the World” in Series 1?) there’s an Ark traveling through space with the remainder of humanity. The Doctor, Dodo, and Steven arrive on the Ark and accidentally infect the people on board with Dodo’s cold, so the Doctor has to figure out a way to save a civilization whose immune systems can’t handle the common cold. 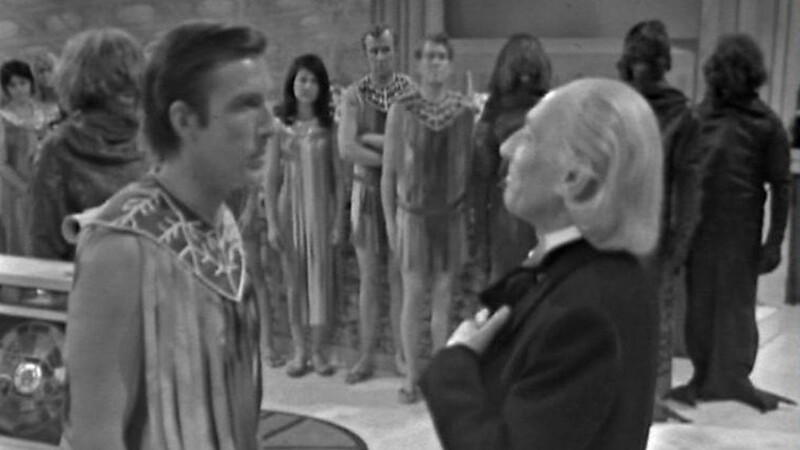 At the end of the second episode, the Doctor and his companions leave, only to end up on the Ark again considerably later, finding the Monoid servants now in control of the human race. 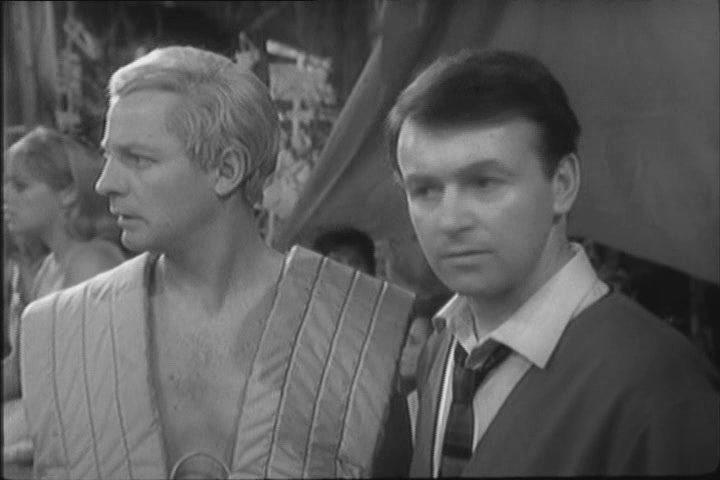 Like “The Keys of Marinus” this story was really easy to enjoy, as it was in smaller chunks, instead of one long one. I think it was the ridiculous nature of this story that made me dislike it. I really got sick of hearing the song about The OK Corral and it felt like they were just playing with cowboy clichés, as they made Doctor Who into a western. Out of principle, I watched the whole thing, but I wouldn’t watch it again. 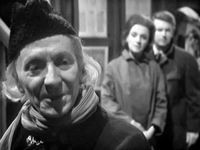 for the first time in "The Tenth Planet"
This one got honorable mention for the first use of the Cybermen and the first regeneration of the Doctor, both of which I really enjoyed. One thing I didn’t like was how little the Doctor was involved in it. 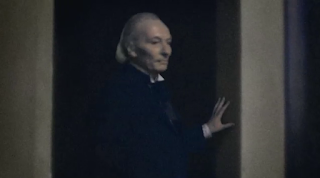 It’s understandable, because William Hartnell’s health was failing, but I think if he had been up for it, the story would have been that much better. But then again, that’s the whole reason we got the regeneration into the Second Doctor, out of necessity. I will say that having seen more “advanced” Cybermen, it was interesting to see their weapons not connected to their bodies. As the Cybermen do, I’m glad that they’ve been upgraded over the years. Ian and the Thals in "The Daleks"
It’s a toss-up between Ian and Steven, but I’d choose Ian. I like the “action hero” aspect to both of them, but there’s something about Ian being one of the first companions that probably speaks to me. Also, he’s shown himself to be clever, often being able to keep up with the Doctor and match wits at times. Least Favorite Companion: I’ll admit that I didn’t get a good sampling of her, but I really didn’t like Dodo. It was almost like she knew the Doctor liked her and she acted like it. 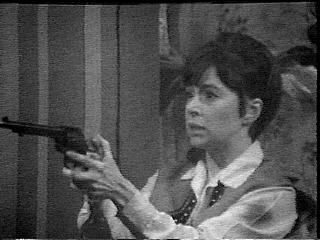 Again, I only saw her in three full stories and a single episode of “The Celestial Toymaker” but all the same, I found her to be a really flat character. It was like she was Susan without any character development. The First Doctor "returned" for a flashback in "The Name of the Doctor"